Thomas Bolling Robertson was the first member of the U.S. House of Representatives to represent the state of Louisiana, its third Governor, the Attorney General of Louisiana before and after statehood, and a United States federal judge. Robertson was born near Petersburg, Virginia. After graduating from the College of William and Mary in 1795, he read law to enter the bar in 1806 and briefly practiced in Petersburg. He moved to the Territory of Orleans and was appointed Territorial Attorney General by Governor William C.C. Claiborne, from 1806 to 1807. He was then Secretary of the Territory of Orleans from 1807 until 1812, in which year Louisiana became a state, on April 30th. Thomas Robertson was the state's first representative in Congress. He served four terms as a Democratic-Republican, until his resignation in 1818. He briefly returned to private practice in Louisiana at that time, where he was appointed Attorney General of Louisiana from 1819 to 1820. 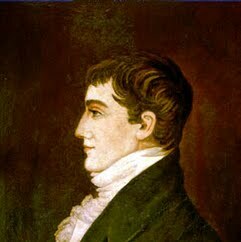 Subsequently, Robertson was elected Governor of Louisiana in the 1820 election and served from 1820 until his resignation in 1824.